Sutler Scrip, Tiffany Brothers Commission Scrip, Fractional Currency Mimic Notes and Round Cardboard Scrip. The issuance of merchant scrip can generally be traced to four periods of financial hardship during the early history of our country. The first was the years of the War of 1812 and extending through 1816. The second was due to the effect of the destruction of the Bank of The United States in 1836 and the suspension of specie payments of the State Chartered Banks, 1837-1840. 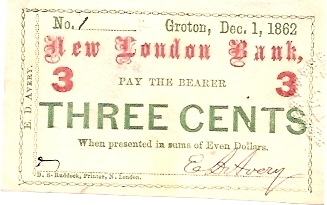 The third was the direct effect from the Civil War from 1861-1865 when specie payment was again suspended and the government issues of fractional currency began to appear. The fourth was referred to as �The Panic of 1873�. These were years of inflation, hoarding of precious metals and coins and general uncertainty. During the first period the banks issued much of the fractional paper currency used in commerce but during the second period they mostly abstained due to new laws prohibiting the issuance of paper money in denominations of less than what their charters allowed. During the third period hoarding of all coinage became rampant again due to the uncertainty of the Union and the rising value of coinage metals. During the fourth period people hoarded not only gold and silver coin but Greenbacks as well. Business clients were withholding cash payments causing businesses to fail. 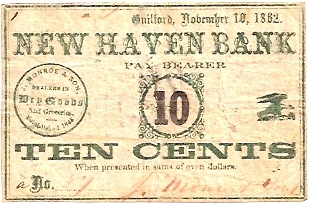 The challenge to facilitate small monetary transactions was met by many of Connecticut's merchants by issuing scrip. 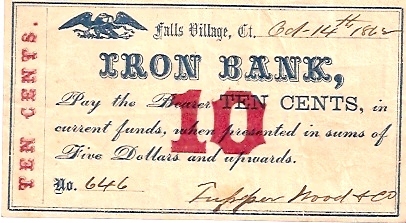 They issued scrip notes, mostly in amounts of less than one dollar. 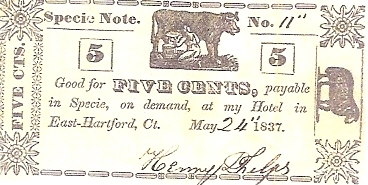 Gather up a full dollar's worth and they might redeem these by giving you a note issued by the local bank, or use the scrip for its face value when paying for another purchase. Not all merchants issued scrip but those that did seemed to be the more financially stable and reputable. These pieces could be passed from person to person in the community and often taken at face value by other merchants knowing well enough that the primary issuer would redeem them as stated when presented. There was no formal �backing� for these issues. The merchant's word was his bond. 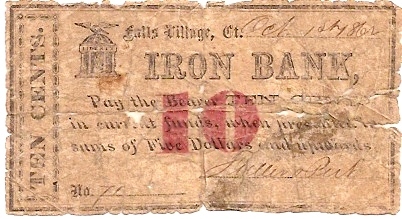 Merchant issued scrip before 1865 could have been printed in almost any denomination. It depended heavily on the merchant's needs. Most were printed on paper but some were also printed on cardboard. Tokens and Store Cards of metal or other composition are not in the scope of this writing. 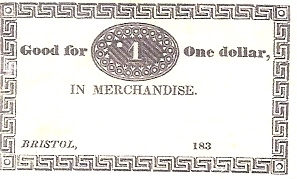 Denominations varied from cents to full dollar amounts. The issues denominated in 6 & �, 12 & � and 37 & � cents directly related to the Spanish Milled Dollar or �Piece of Eight� which was legal tender in the United States until the time of the Civil War. The U.S. dollar coin was worth one Eight Real (Piece of Eight) coin. The U.S. Quarter Dollar coin was equal to the Two Real coin or the often touted, �Bit�, (one section of an Eight Real that was cut into four equal sized pieces). Hence, the Quarter was equal to two Bits, just enough to pay for a shave and a haircut. 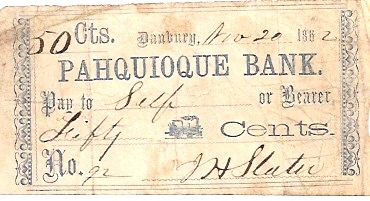 Sutler Scrip was issued by private merchants who traveled with the various regiments during the Civil War. Sutlers served somewhat like a Post Exchange and also issued scrip to facilitate the making of change while doing business while in camp or on campaign. 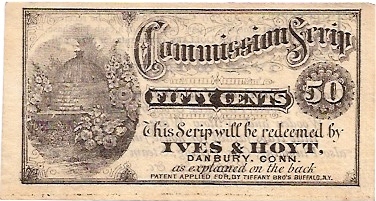 Tiffany Brothers Commission Scrip was a product directly related to a short lived but severe economic depression during the years 1873-74. It was devised to stimulate business by offering a discount on a later cash purchase. Fractional Currency Mimic Notes did not have a value but did have a numeral and somewhat mimicked the new U.S. 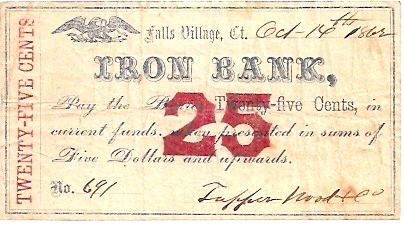 Fractional Currency issues which appeared from 1862-1876. These Mimic Notes served mostly as advertising pieces. 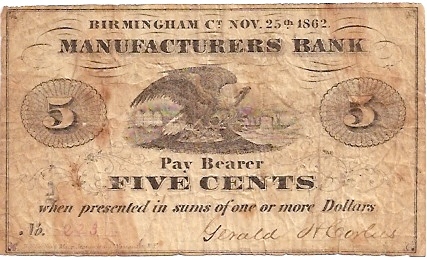 Round Cardboard Scrip produced by the firm, Cussons, May & Sheppard had an easily recognized and distinct appearance and can be attributed to the 1870's. The general appearance remained the same for all the issuers. 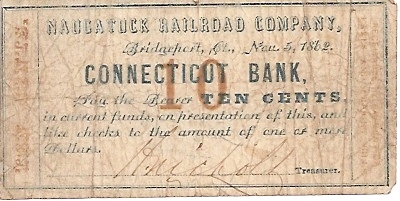 To date, only one Connecticut issuer of Cusson's Cardboard Scrip has been identified. The rarity given for each note is approximate. Values are not assigned. The notes' rarity will be described as: Common (C), Scarce (S) or Rare (R). 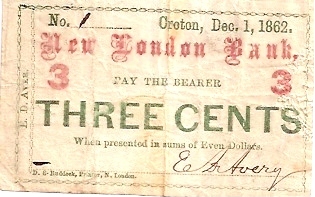 Scrip was issued undated and with handwritten or printed dates. Items listed with handwritten dates may have the first 2 or 3 numbers of the year printed and the remaining digits written. While more than one handwritten date may be known per denomination and issue, only one will be listed to indicate the general time period of issue. Items with different printed dates represent completely separate issues. All issues are listed alphabetically by city or town of issue except the Sutler issues which will appear and the end of the listings. Printer B. F. Corlies & Macy Stationers 35 Nassau St. N.Y.
Ferd. Mayer & Co. Lith. 96 Fulton St. N.Y.
Danforth, Underwood & Co. New York / Underwood, Bald, Spencer & Hufty Philda. 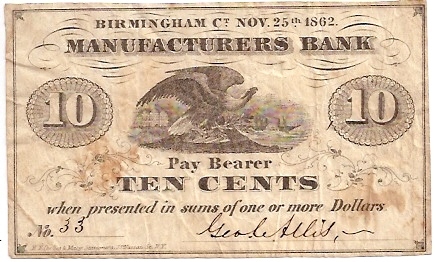 D. Bulkeley & Co. payable in Selma, Ala.
Patent applied for by Tiffany Bros. Buffalo, N.Y.
Denomination printed with thin flat letters on left end. 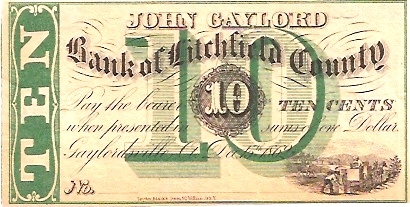 Denomination printed with thick block style letters on left end.